Most people rely on computers every day. Computers have to be replaced at some point. When you are in need of a new desktop unit, then you need to find the sweetest deals out there. That is the reason for this article. 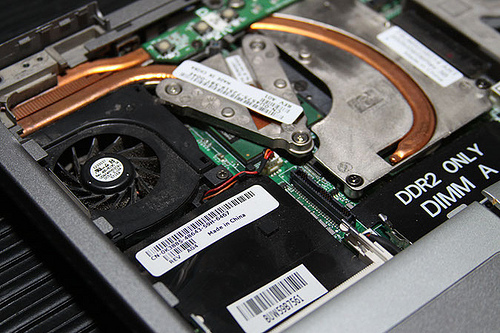 Here are some great tips for buying a new desktop. Always use antivirus software. If not, you could end up with malware. It can steal all of your personal information and affect the speed of your computer. Many of the programs run scans and repairs your computer regularly when you set it right. Look around for users who are giving their old desktop computers away. 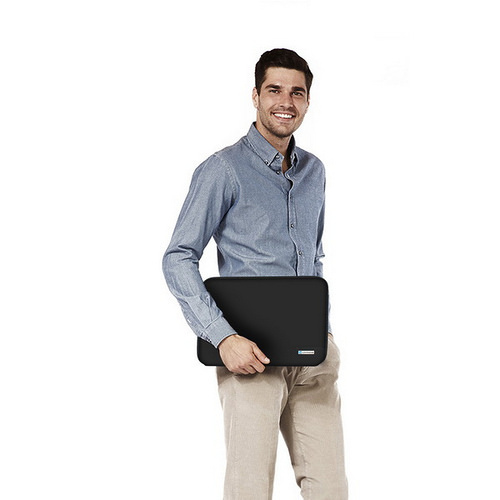 Many people are getting tablets or laptops instead, and decide to sell desktops. 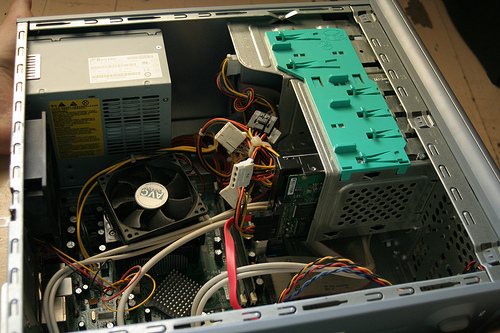 Usually, these computers are in good shape, but before making an offer, be sure that the computer works fine. Try performing a boot check if your desktop is sluggish. Look in the start menu for a program named "ms config." This menu will show which programs are launched every time the computer boots. Stop programs that you aren’t using from launching at start-up. This will make the system run faster. Carefully choose the hardware you put into a computer you are building. There could be compatibility issues with the motherboards and processors. 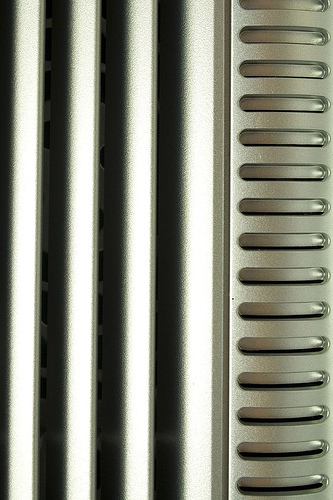 Some RAM units will only be compatible with some motherboards. Make sure all the products are compatible. If you pay attention to all these factors beforehand, you will end up saving yourself a lot of trouble in the end. 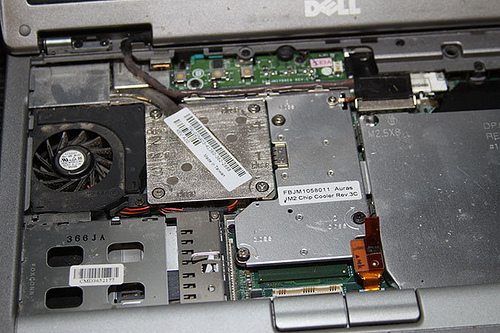 The interior gets dusty and ought to be dusted at least once weekly to ensure the computer operates optimally. 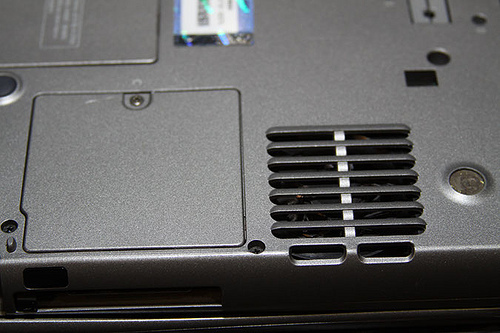 It is not hard to unscrew and remove the outer casing and use compressed air to eliminate dust. 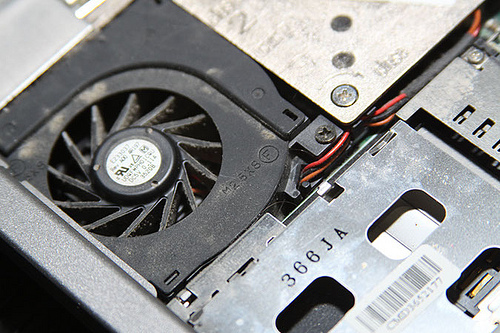 This will keep the computer clean, and allow the fan to do its job. 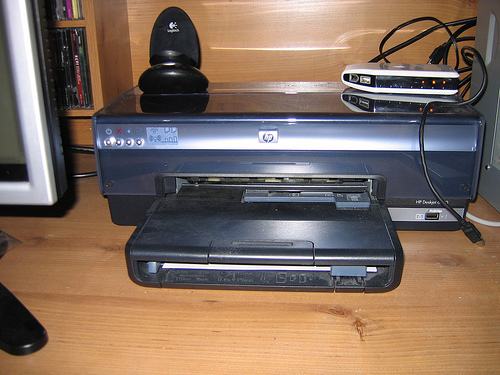 My HP DeskJet 6840 Color InkJet Printer (with WiFi, Ethernet or USB connectinos). I’m using Ethernet. On top of it is the base for my Logitech MX1000 Laser Cordless Mouse. Off to the right is my IOGEAR USB/Firewire Hub. This is the HP iPaq hx2490, which has now replaced my Palm TX as my PDA device. In case you’re curious, I actually had an HP iPaq rx3115 to start off in 2005, back when PDAs were in their glory days (it is very hard to find them anywhere anymore, as they have been replaced with smart phones and Blackberries). By the end of that year, it died and because I purchased the Best Buy extended coverage plan, I was able to exchange it with a Palm TX which had just come out (it’s not that I hated Windows Mobile, but I really did want a Palm from the beginning, but at the time, Palm didn’t made a device with built-in wifi, so I had to "settle" for the iPaq). 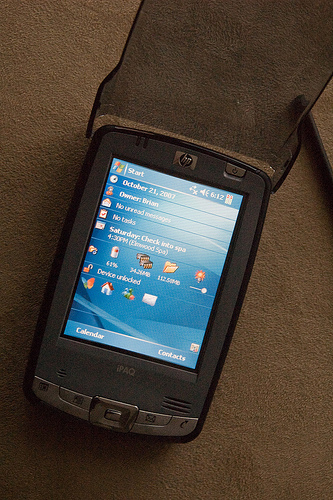 The Palm TX was feature-rich with wifi, Bluetooth, consumer-IR (versus shorter-range standard IR), 128MB memory, and a very nice 320×480 display. It was a great device and served me well, and was a life-saver when I had to keep track of items that were destroyed in my basement flood, as well as serving as a reliable secretary during both of our condo moves. This wasn’t surprising as Palm’s calendar, to-do list, note pad, and contact applications are stellar and it is a dream (and fast) to navigate through everything, especially during those emergencies when you have to access information quickly and easily, like while driving. As great as it was for data management and syncing to a desktop PC, I found that the Palm fell below par in most other areas, particularly web browsing and character recognition. These are areas where Windows Mobile devices shine. So what hapened to my Palm TX? A few weeks ago, it wouldn’t power on. I managed to revive it eventaully, but then it permanently died a few minutes later. I still had a few months left on my extended coverage plan from Best Buy, so I took it back to them and they deemed that the device needed to be replaced with a new one. Did I switch back to the Windows Mobile by choice? Not exactly. Palm has apparently discontinued production on the Palm TX, so Best Buy wasn’t getting any more in stock. The only equivalent they had in stock (and this was a difficult process as they only had 2 remaining, both at a different location), was the HP iPaq hx2490. It was priced at $469.99. Since my Palm was $399.99 when I purchased it, and they couldn’t get another one for me, they did a straight exchange on this one (after a bit of a dispute–thanks Melissa for helping me out on that!) 😉 They wanted to give me a Palm Tungsten E2 as a replacement, but this model only has a square screen and no built-in wifi (but it did have Bluetooth and IR). So after over 2 years since my first PDA purchase from Best Buy, I have myself a new one. Again. Without having to buy another one. However, this time I elected to not purchase the extended coverage, and will settle for HP’s manufacturer warranty. -Windows Mobile 5. This is better in many ways than Windows Mobile 2003 SE I had on my first iPaq, and much, much more modern than Palm OS 5.4 which I had on my Palm TX. I don’t really like the new 2 soft buttons at the bottom of the screen versus the old grey menu bar, but the way the OS handles persistent memory and file storage is a huge upgrade over 2003 SE. The Today screen is much-improved, too. -The screen. Great contrast, colour, brightness, and it has that slippery feel when you write on it with the stylus. Palm’s screen was dull, rubbery-feeling, attracted a lot of dust, and horrible to use outdoors. Even though this screen is only 240×320, versus the Palm’s 320×480, It’s better overall. -Text entry. Palm has Graffiti 2, which is horrible. It shouldn’t be a challenge at all, but more times than not, the system decided to interpret my "t"’s as "i ." There was a hack where you could install the far-superior Graffiti 1, but it had a bad conflict with the Blazer browser, so it wasn’t an easy trade-off. Windows Mobile has Transcriber (cool but flaky to use sometimes), character recognizer (exactly like Graffiti 2 only reliable), block recognizer (similar to Graffiti 1), and keyboard entry. But even keyboard entry is better in Windows Mobile because you have mouse gestures which makes it super-easy to capitalize characters. -Applications. I was extremely disappointed by the Palm’s lack of solid applications when I got it 2 years ago. The Blazer web browser was a joke for browsing anything but text, VersaMail was flaky sometimes, Adobe Acrobat Reader was nothing short of an insult, and there weren’t a lot of "cool" applications available. Right away with my new iPaq, I got Google Maps for mobile, which is fast, pretty, and amazing in every way. Adobe Acrobat Reader is wonderful on Windows Mobile. Again, something I really missed when I first switched to the Palm version. -Voice recording. I missed this feature when I didn’t have it on my Palm. Even if I don’t use it much, it’s good to know it’s there. -SD and CF slots. My cameras use one or the other, and now I can copy images from both and see them on the screen right away! -128MB memory. It’s good to have a lot of memory when running any Windows system, big or small! My palm also had 128MB, which was almost overkill, but this device really needs the space! -It is Windows, meaning that my Mac won’t sync with it. Unless I sync it while running Windows on my Mac! Or… I could get 3rd party Mac software like "The Missing Sync." -It uses Outlook for syncing mail, tasks, notes, calender items and contacts. I was never a big fan out Outlook, but I think I’ll switch to it at work, even though I really love Thunderbird. I might install Outlook at home, too, but maybe just for everything except email. -it is large. I actually hated this model when I saw it in stores, but now that I actually use it, it doesn’t feel so large. It does have a nice rubbery grip surrounding the entire case, so that might save it if I ever drop it! It feels good in my hand, too. -Data entry. While I love Windows Mobile for all its different text entry options, actually entering data can be frustrating. It just takes too long. Too much scrolling, clicking, all while having to use the stylus. And then finding your information afterwards. It’s very desktop-computer like, but because you’re not using a desktop, it can be slow. Palm was far superior in this aspect with its incredibly fast and simple PIM apps. That is all. Now… time to play! I won’t be able to afford a new computer anytime soon so I’m starting to wonder how much I can do with what I’ve got. Upgrades, anyone?